See, it's really simple isn't it. I think the key is toasting the bread to a golden crisp without burning it. So make sure you watch it like a hawk when baking. Btw, if you are planning to use a toaster own, make sure to turn down the heat to around 300F. Since our first time was a complete success, we just had to do it the 2nd time. This time it turned out even better, no burnt area at all XD. The bread was buttery and crispy yet still soft in the middle. I don't know if you have noticed, but both honey toast box have some really nice drizzle sauce on top. 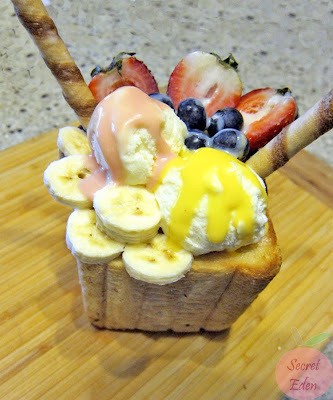 There are really delicious and definitely deserve to be mentioned. 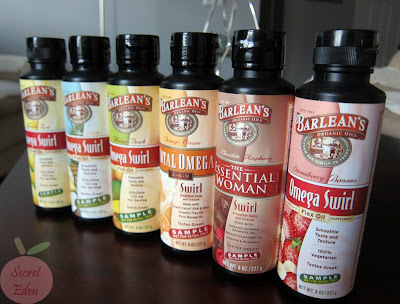 Awhile back I went to the Wellness Show, a company called Barlean's was show casing their omega oil in 6 delicious flavors. After showing high interest in their products, they were kind enough to give me all 6 sample bottles to take home. 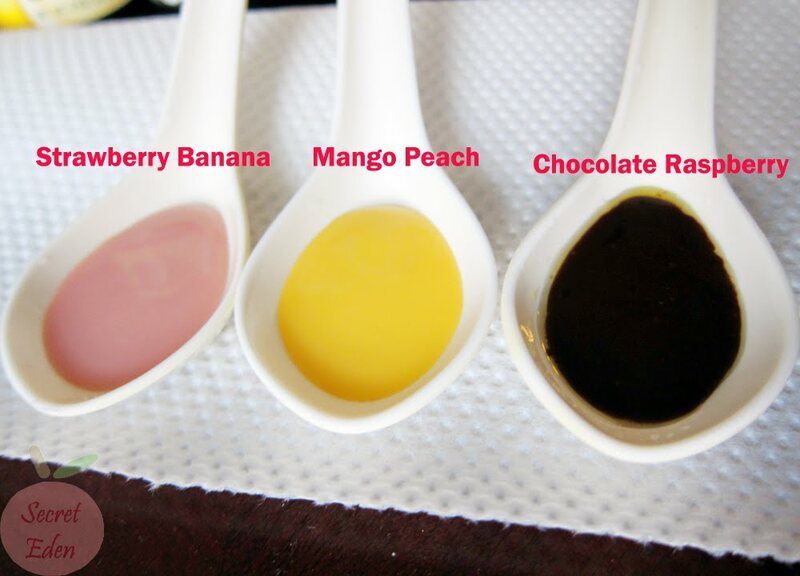 I simply loved the strawberry banana (favorite), it tasted like a smoothie. The peach mango is also great, the mango flavor really shines through. Since I am not a fan of chocolate, so I didn't really like the chocolate raspberry, but this one is especially designed for women:P. The lemon zest goes great with desserts. 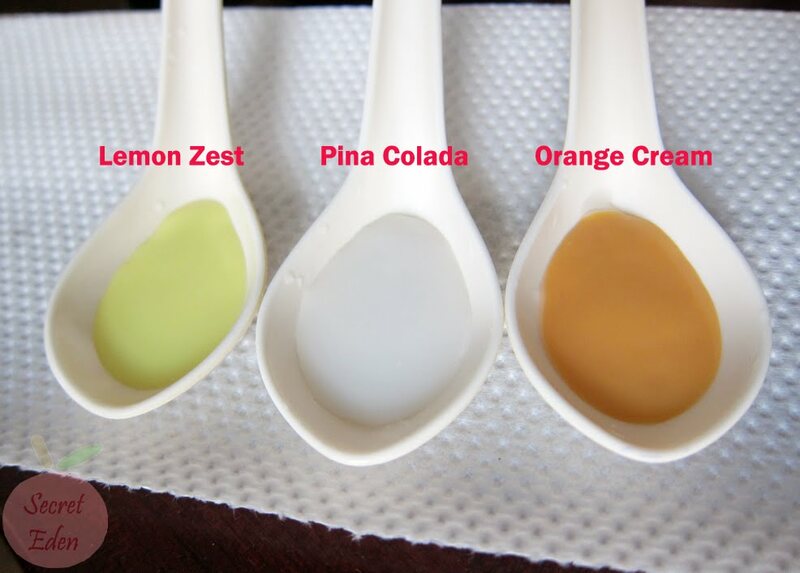 The pina colada would be perfect to add to the actual drink. Last but not least, R's favorite flavor orange cream: a very smooth creamy orange flavor that goes great with plain yogurt. All these sauces are great, because it certainly dresses up anything. 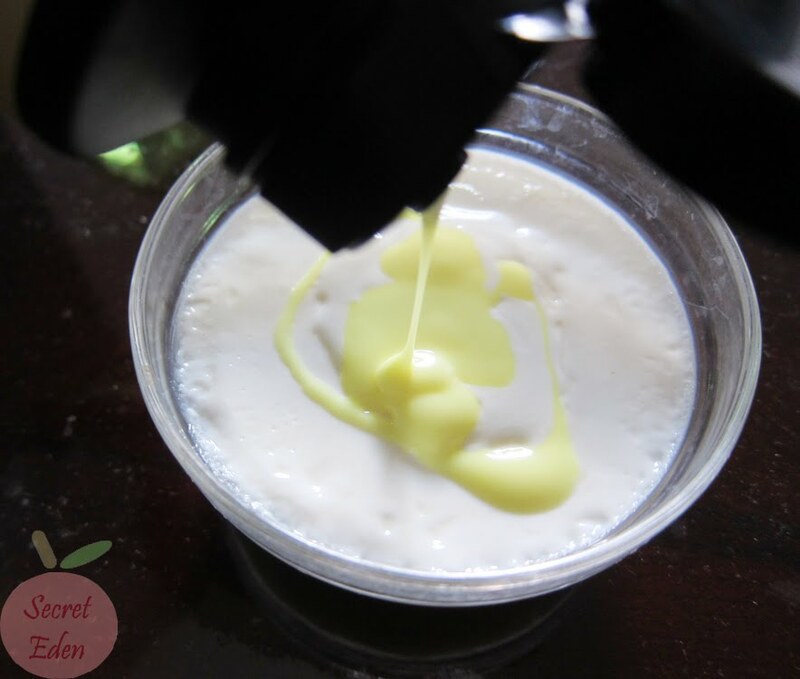 This will make your plain yogurt less boring, and enhance the flavor of your dessert, and add beneficial omega to your smoothie. Although it may sounds like a commercial, but I was not paid to write about them, nor do they know I was going to do so. I am simply writing this because I have tried them with all the things I mentioned above and I loved it. Also I have to say their omega really do taste the best, because I've recently tried So Good with Omega, and I hated the 'fishy' taste. So really I have to give props to Barlean for making omega taste so good (for real this time, unlike So Good XD) . PS: I've seen them at Capers, but they are probably available at other markets as well. 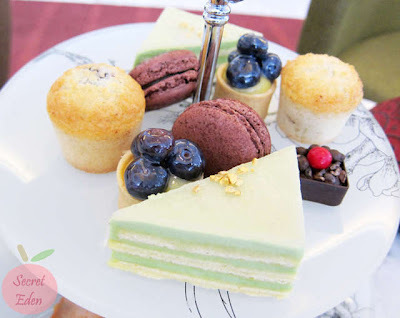 Afternoon tea is really the perfect activity for girlfriends to meet up and catch up, and that was exactly what we did. Because of certainly event, J had decided to treat us girls to some nice afternoon tea. 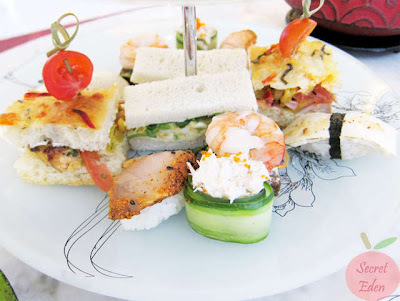 After a short discussion, we decided to try the afternoon tea at Shangri-la because of the good reviews. 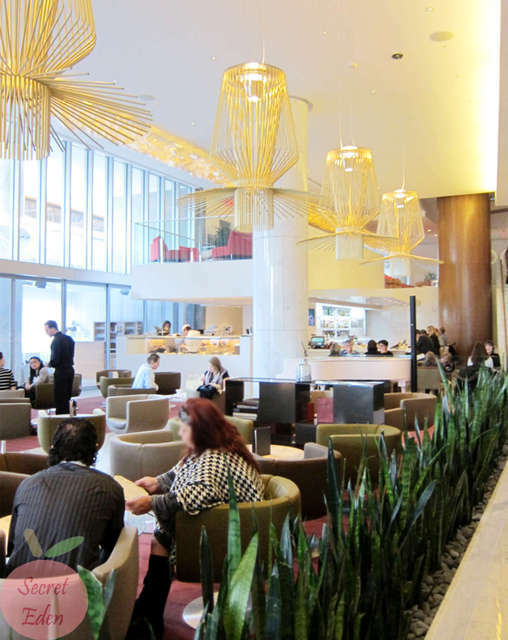 The Shangri-la's lobby lounge was nicer and more intimate than the one at Fairmont Pacific Rim. 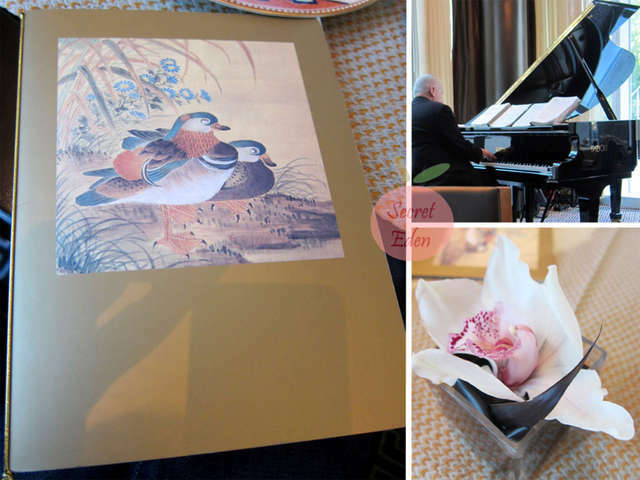 It actually felt like a proper upscale restaurant. To make the place even better, they had live music. The pianist of the day was great, and he certainly upgraded the overall ambiance. Here at the Shangri-la, they did not have the actual tea for us to see and smell, so we had to choose base on the description. The tea I chose was called Heaven and Earth: mildly tart Sencha with strawberry and kiwi. I got to say, this tea was great. The flavor was smooth without that usual tartness from the fruit. It was tasted even better with a bit of rock sugar to add a touch of sweetness. The one thing I really liked was the strainer they provided with each cup to prevent tea bits from falling in. 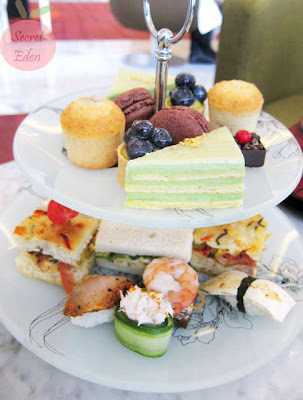 When they brought out the food, they informed us that their afternoon tea menu changes often. 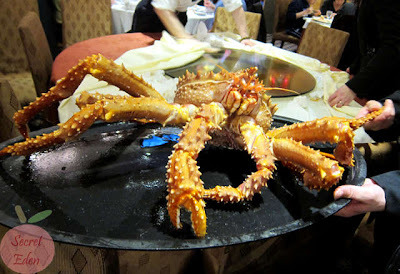 In celebration of Chinese New Years (I went in Feb.), their Feb. 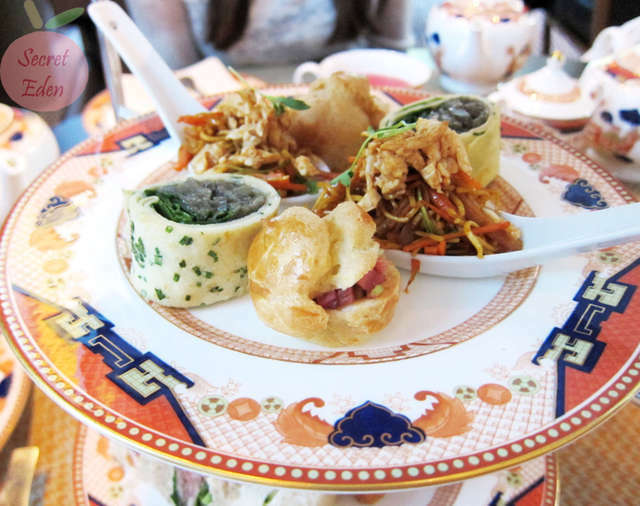 Afternoon tea is Chinese cuisine inspired. One look at the 1st and 2nd tier, it is indeed very much Chinese inspired. As always, the scone was was buttery and soft. It was only slightly warm. 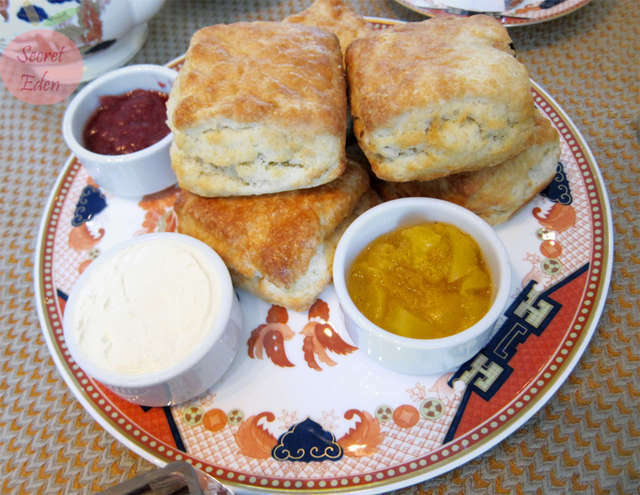 I think if it was served warmer, it would have help the devonshire cream and jam to really sink into the scone. There were definitely good, but certainly not the best I've tried. Although it looks like there were only 2 sandwich, but the one in front is actually 3 small sandwiches stuck together: pickled Cucumber with cream cheese, pacific candied salmon and roast beef. The consensus was that they were pretty blend, and did not stand out. However, the egg salad croissant certainly did. The croissant was buttery and flaky, and the moisture from the egg salad help to held it all together. The combined flavor was just perfect. This was by far my favorite of the day. Chive crepe with Japanese Eggplant: this was really mushy/cold and tasted like left overs. Char Sui Profiterole: basically a small puff with small bits of Char Sui. Chicken and Wonton Salad: this was mostly soy sauce flavor. To be honest, none of us really liked this layer, it was just average or even below average. Osmanthus flower and goji berry jelly: I was really excited to try this, as I love the smell/flavor of the Osmanthus flower, but unfortunately the flavor was too light. So basically it just a slightly sweet jelly, and nothing special. Opera cake: This would be a dark ganache cake. I like the slight bitterness to balance out the sweet layer. Sesame ball: this was not good at all. The ball was really hard, and it had no fillings. I think I had better ones at Chinese Buffet restaurants. When I first heard that Man Ri Sung was closed, I was disappointed. You see about almost 2 years ago, I discovered this restaurant and that they had really cheap/great lunch combos. Later on, I went on to discover their new duck fest (blogged here), which really made an impression. So when Chowtimes blogged about spotting the new Man Ri Sung restaurant opening up in Richmond, I was certainly happy. 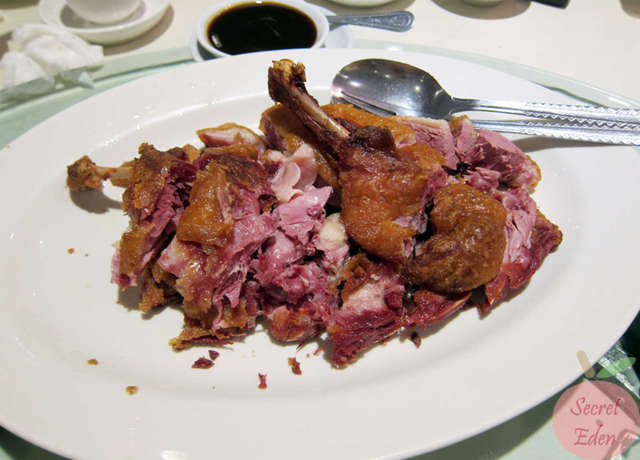 Since it seems the duck feast also made a great impression on Ben and Suanne, they have decided to host another Chowtimes reader dinner which I gladly help to organize (because the chef only speaks Mandarin or Korean). 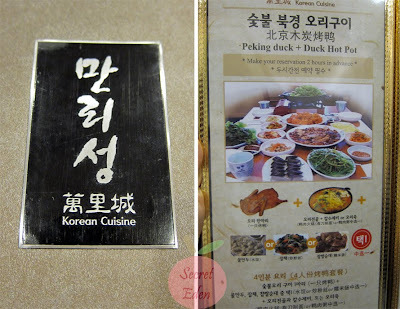 The new Man Ri Sung restaurant is located in a square mall across from Richmond Public Market. Given the traffic in that area, I'd say they picked a good spot. 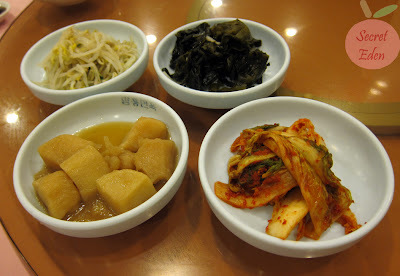 As usual, the side dishes arrived first. These are pretty standard, but they did have my favorite potato dish which I loved. 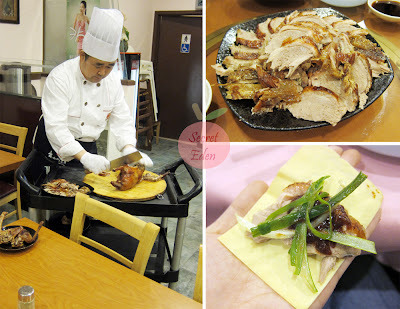 Originally we ordered 5 duck feast for 20 people, because each one is intended to be share by 4 people. However because of our table arrangements, the chef has suggested that we just get 4 duck feast for the two tables, but substituted the last feast with extra dishes instead. 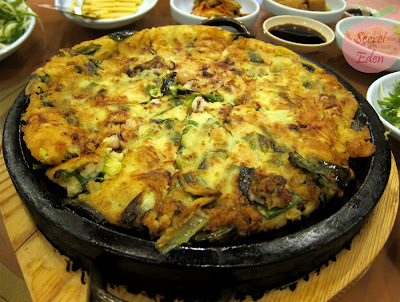 So the first dish he suggested was the seafood pancake ($13.99). It was hot and crispy, just the way I like it. 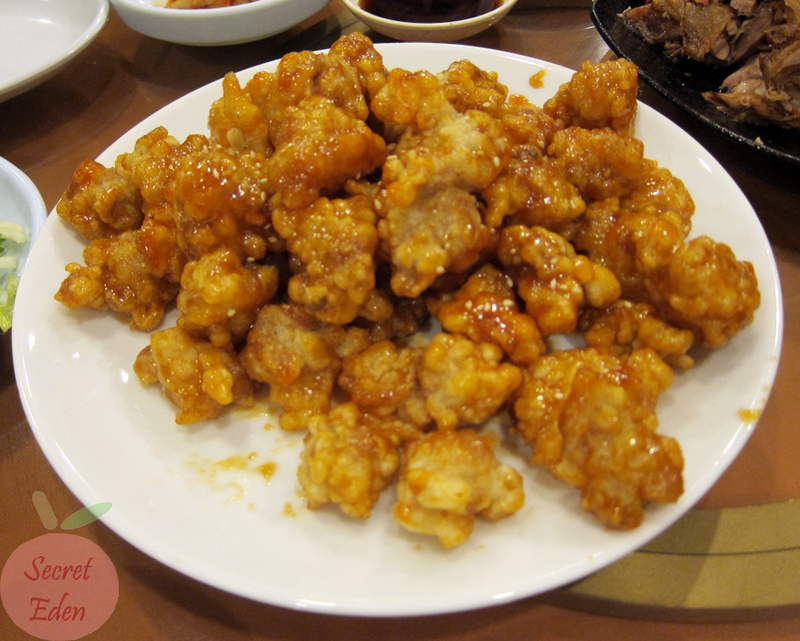 The 2nd dish that we added was their deep fried chicken with spicy sauce ($14.99). Although it may look like sweet and sour pork, but it tasted so much better. The chicken was coated with a glutinous batter, so when you bite into it, the texture was slightly sticky. I also really liked the spicy sauce. 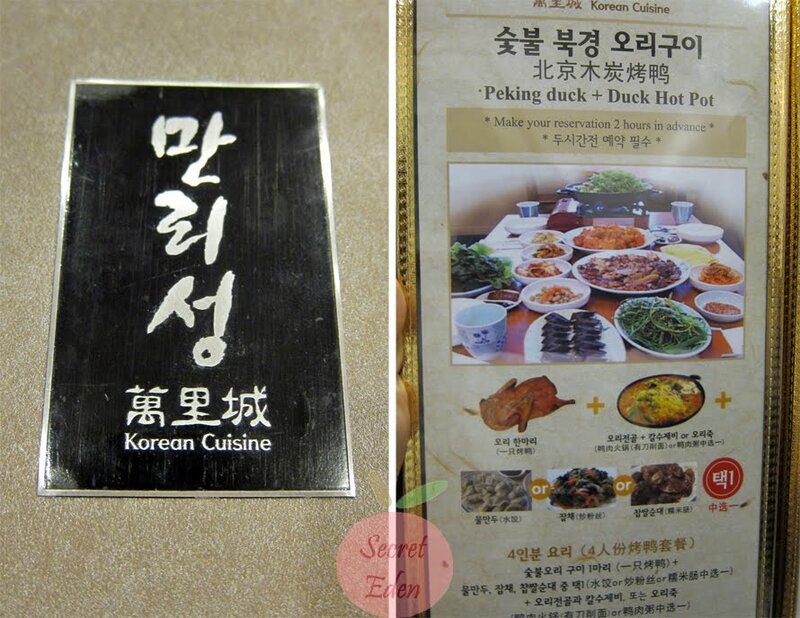 Finally the 'star' of the night arrive: the charcoal grilled duck. Just like old time, he wheel out the duck and carved it in front of everyone. The duck was just as good as I remember, it was grilled perfect with all the moisture and none of the fat. Once again they don't give you the typical flour type wrap, instead it's the bean curd type. They also curved off the wings for us to enjoy. These wings were certainly unique, because the whole thing was edible, including the bones (it was that crispy). It was like eating chips. 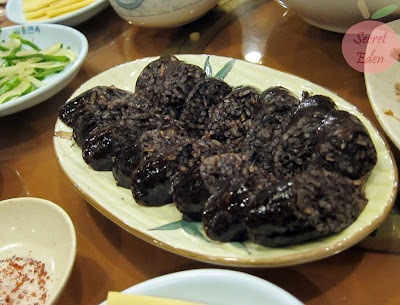 Although it was very interesting to eat, but I wasn't really a fan of it, as it didn't really have any flavor. The feast also came with a choice of knife cut noodle hot pot or congee with the remaining duck meat. Since we had 2 duck feast per table, thus we ordered one of each. This would be the duck congee made with a mixture of brown rice and sticky rice which resulted in a rather creamy texture. 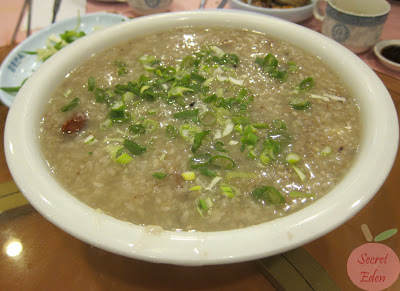 The congee was also very flavorful due to smoked duck meat they used to cook it with. 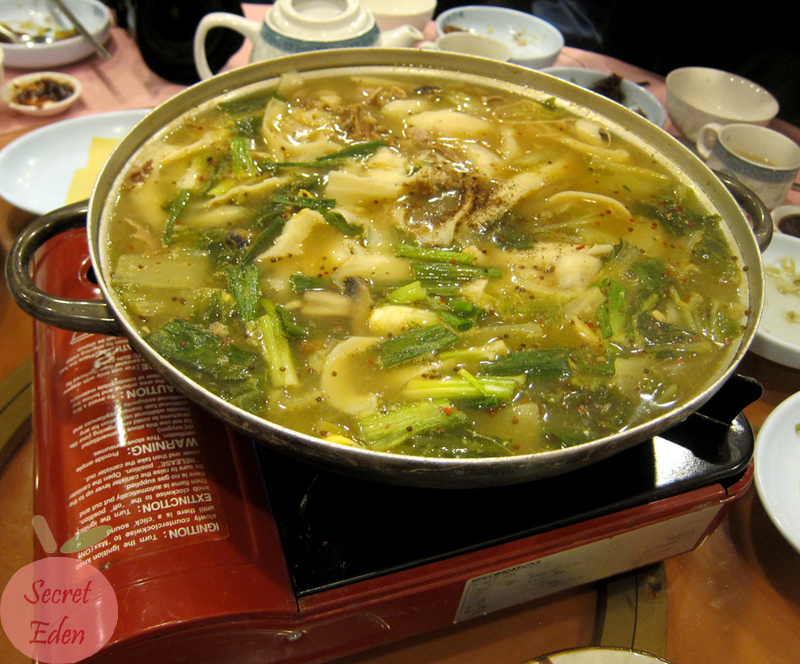 Although the duck congee was good, but I still preferred the knife cut noodle hot pot.The soup was to die for. After conversing with the chef, we found out that he does not use any form of MSG, just simply the duck meat and spicy/herb. 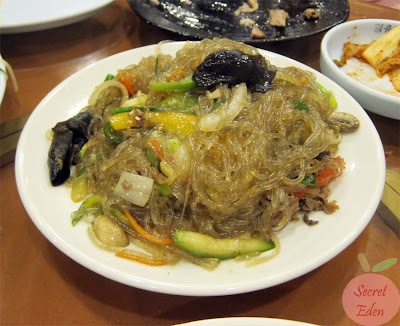 The noodle was good, but it lacked the usual chewiness, I think it's a bit over cooked. The Jap Chae was good, but nothing really special about it either. The portion size was rather small, but I guess this was really meant to be share by 4 people only. Service here was a bit slow, it seemed they only had one waitress that night, and it was a Friday night too. Also it seems like their heating system was not that efficient, because despite all that food, I was still feeling cold most of the time. Anyways, they do have some kinks to work out, but their food was solid. So what's the total damage after this very filling meal: $18/person including tax and tip. I'd say this was a very worthy meal and I definitely recommend. Of course, the best part of the night was still meeting new friends and chatting about food :). Theme cafes are hugely popular in Taiwan, just like the Hello Kitty cafe which I visited. 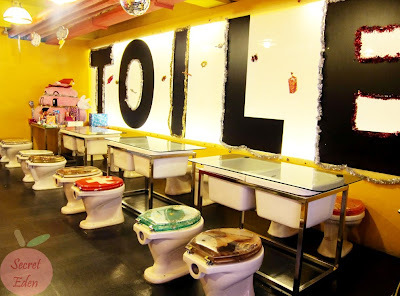 I can't remember when, but I know it was ages ago when I first heard about the toilet theme cafe in Taiwan. I still remember my reaction "What! 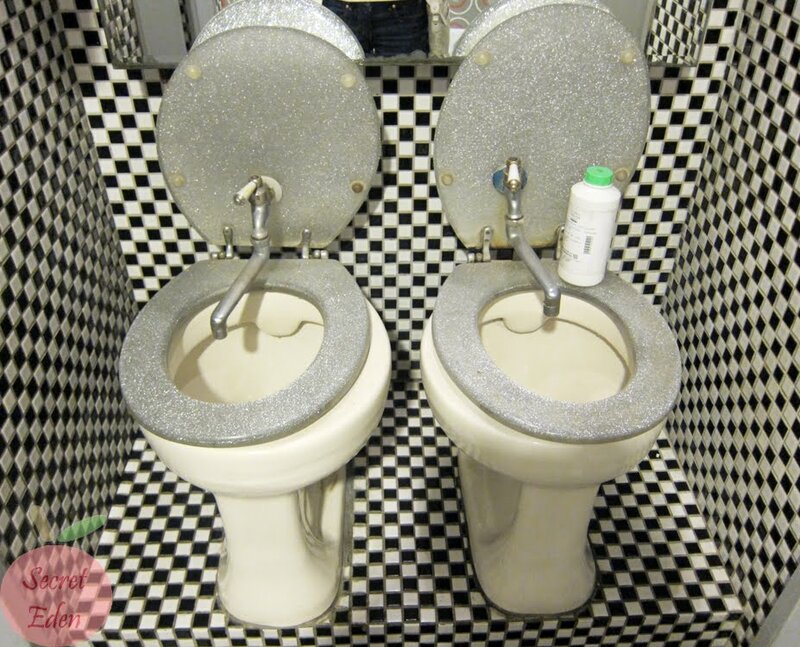 Toilet cafe, interesting, but isn't that kinda gross?". Despite that attitude, I still insisted to R that we must go try it. There actually quite a few stores all over Taiwan. The one we chose to visit was in Taichung. 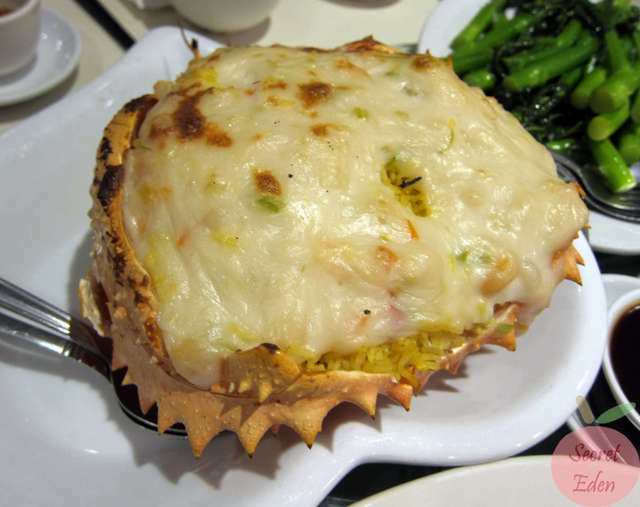 It was located on very popular/busy Yijhong St. I was almost reluctant to visit, after seeing all the delicious Yijhong street food. Anyways, the restaurant was interesting, all the tables are either sinks or shower tubes with a glass table top. 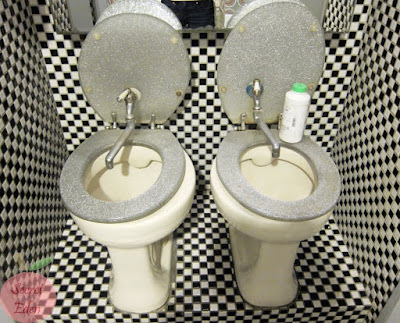 Of course, all the seats are toilet decorated with different seat covers. R ordered their House special item: curry chicken with rice($6). 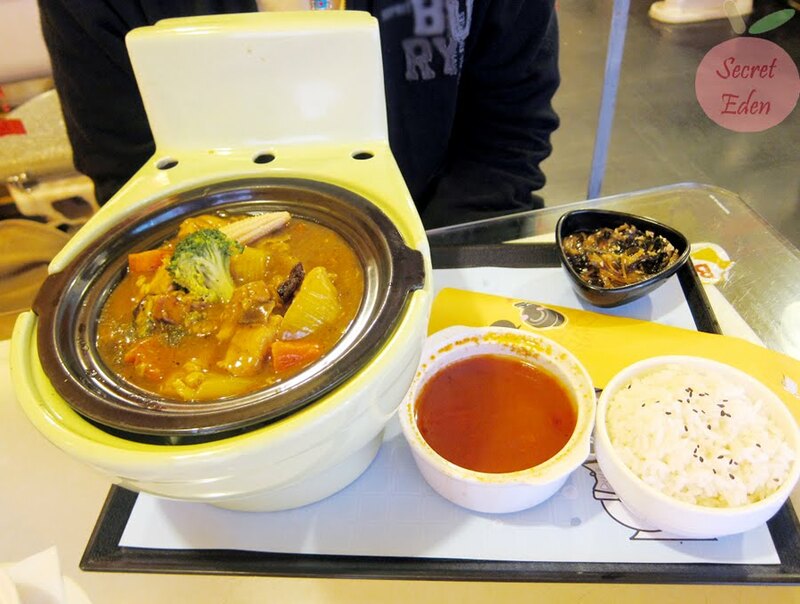 I know it's a theme restaurant, but still when I saw the curry in the toilet bowl, somehow it did become less appetizing. Anyways, despite being one of their most popular items, this was just average. The vegetables was rather soft and mushy. The curry was not as strong as I would have liked. What I order turned out to be a set meal, with a separate soup. 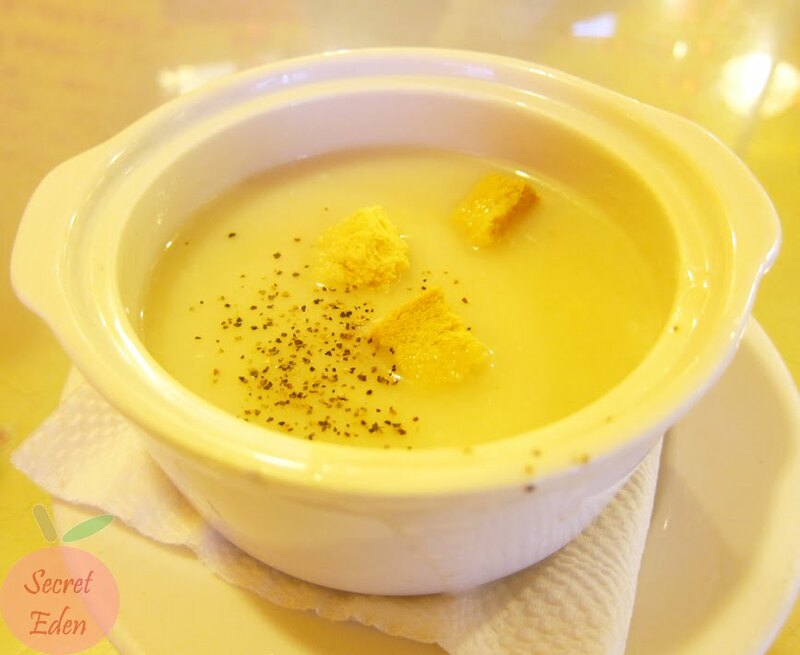 It was suppose to be creamy soup, but it tasted really water down and a bit bland. 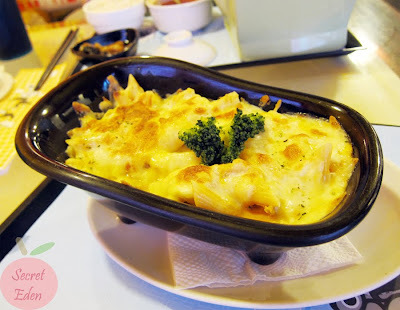 I ordered a Tom Yum baked Penne ($7.50). Despite the average food above, this was actually good. The sauce was a combination of creamy coconut milk and tom yam flavor which I loved. The baked cheese only enhanced the dish. I also liked the fact that mine came in a cute bath tub (which seemed more appetizing). 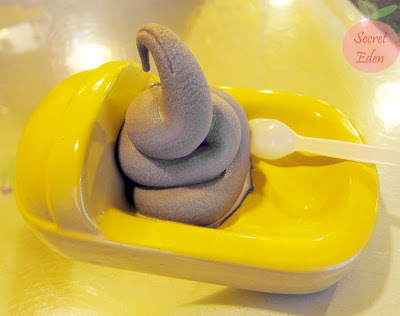 All the meal here came with dessert: chocolate soft serve (you can imagine why chocolate :P). Although the consistency was good, but the flavor tasted water down, and it wasn't creamy enough. Last but not least, I have to share this picture. This was the share sinks outside the men/women washroom. To be honest, because it does have some yellow stain around it, I felt a bit queasy washing my hand here. After trying the food at Modern Toilet, the novelty certainly wears off for me. I mean the restaurant was certainly unique, but I think Taiwan just has way too many delicious restaurant/street food to try. 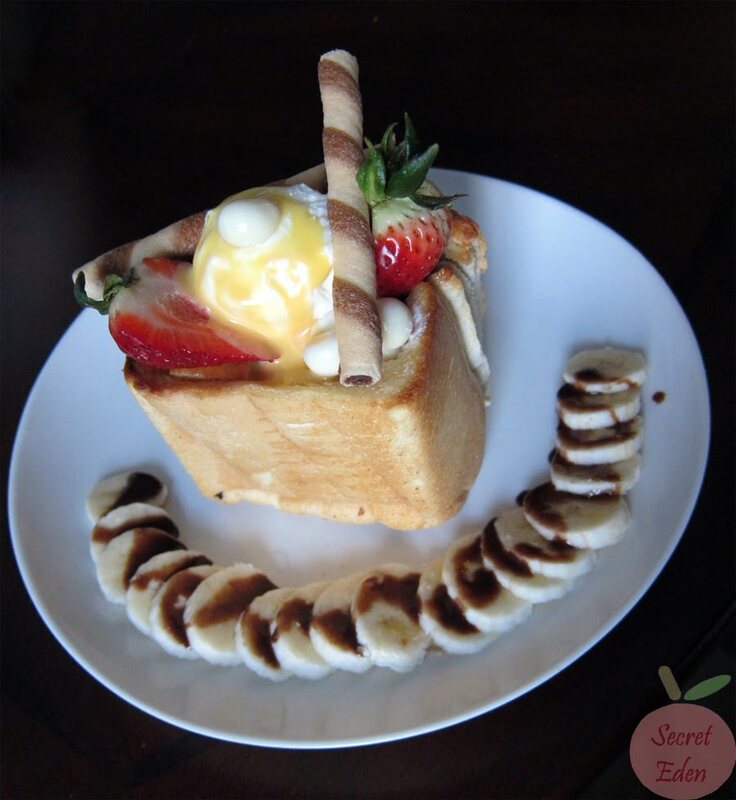 So if you are person who doesn't really care for the food, but loves a theme cafe, then this place is perfect for you. Other wise, skip it, and just enjoy the countless street food on Yijhong street. Afternoon tea is one of my favorite activities, so it's my goal to go to as many as possible. 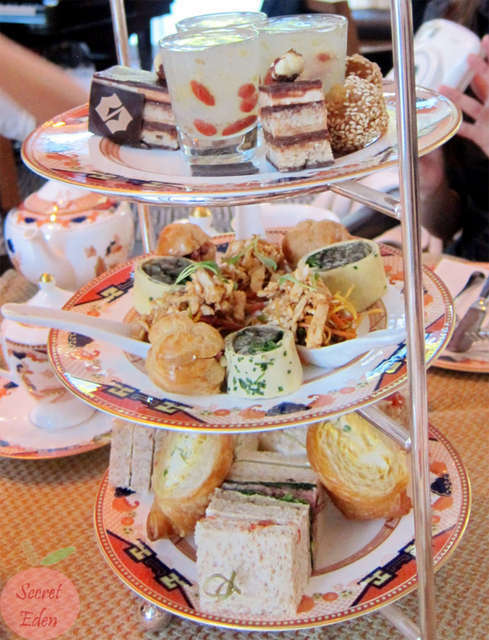 So when a 2 for 1 ($35) afternoon tea deal popped up on SocialShopper for half price, I immediately snatched it up. Afternoon tea at the Fairmont Pacific Rim hotel is served at the Lobby Lounge, which is literally an area sectioned off from the lobby hall. As you can see, the atmosphere is really casual, they used marble top coffee tables, and low swivel chairs. Although very comfortable, but the ambiance is not as intimate when comparing to an actual restaurant (you can hear everything happening at the front gate/desk). 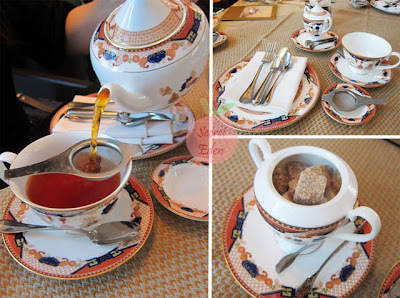 First is the tea, they had the exact same box set tea offered at Fleuri afternoon tea. Personally I loved the idea of being able to smell and see the actual tea. 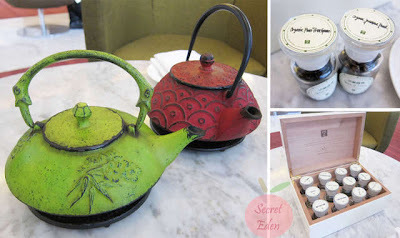 After going through all of them, I decided to go with the Pear Green, while R went for the Jasmine pearl tea. I loved the fragrance of my tea, the sweet smell of pear. The taste was rather light and refreshing. R's tea was more standard, and it didn't really stand out. One thing I must note here is their cast iron tea pot, lifting these required a bit of muscle strength (great for a work out while you eat XD). Next came the sandwiches and sweets. 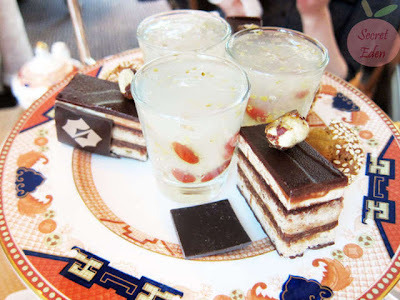 I love their 2 tier frosted glass serving tray. Everything looked really delicious. Also we noticed that the portion seems to be more than other places, at least that's true for the sandwiches. Immediately following the 2 tier glass tray, a plate of warm scone was brought to us. 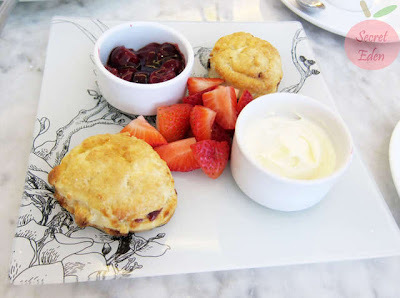 I love their consistency, because the scones were served in a plate that comes from the same set as the 2 tier tray. These scones were great, they were very soft and buttery. I loved the rich and thick real devonshire cream and as well as the sweet jam. Egg salad sandwich: the slightly under cooked eggs made this sandwich very creamy, thus we really enjoyed it. Smoked tuna tataki open face sandwich: love the smokey flavor along with the spice rub. Their rice was rather authentic too. Fresh crab cucumber roll: they used real Dungeness crab, and not a lot of spice, so the seafood fresh taste really shined through. Tofu miso nigiri: R liked it, but I thought it was just too bland. Chocolate square: they used dark chocolate and filled with dark chocolate ganache. Mini muffin: looks can be deceiving, although it looks plain, but it turn out to be one of the best ones. There was a light nutty (macadamia?) flavor on top. The inside was buttery/softy with one large blueberry in the center. Lemon tart: I didn't really like this, because the custard was just too tart. Macaroon: I find them overly sweet in general, but this one used a dark chocolate center which some what balance out the sweetness. 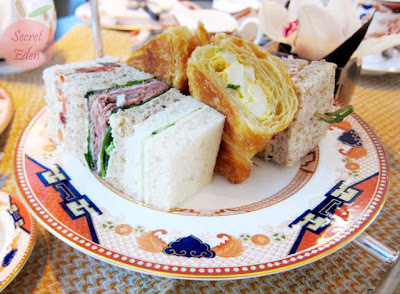 Overall, both R and I really enjoyed the afternoon tea. The service was good, and the food was great. Of course, company is even more important, as you do have to spend the next 2-3 hours talking to that person ;). In the end, I do recommend this place to all who loves afternoon tea, just don't expect too much ambiance. I don't typically blog about a restaurant right after I visited, simply because I have other post lined up, but this time I really have to interrupt 'regular programing' for some breaking news: Alaska King Crab (AKC) for $9.99/lb. How is that breaking news? Well, you see AKC is on sale at T&T for $10.99/lb, but you can have the exact same thing except cooked. To make the deal even sweeter, someone will also wash your dishes and take out the trash ;). The question 'where is it? ', the answer 'Imperial Court restaurant in Richmond'. Chowtimes did a post on AKC and listed a whole bunch of Chinese Newspaper ads, and Imperial Court just happens to be the cheapest one @ $10.88/lb. However we we got to the restaurant their sign read $9.99 and with the slogan "Cheapest crab in town" (of course in Chinese that is). Anyways, we were certainly happy with this surprise and ordered ourselves a nice and fresh 12lb AKC (this big guy was feisty). 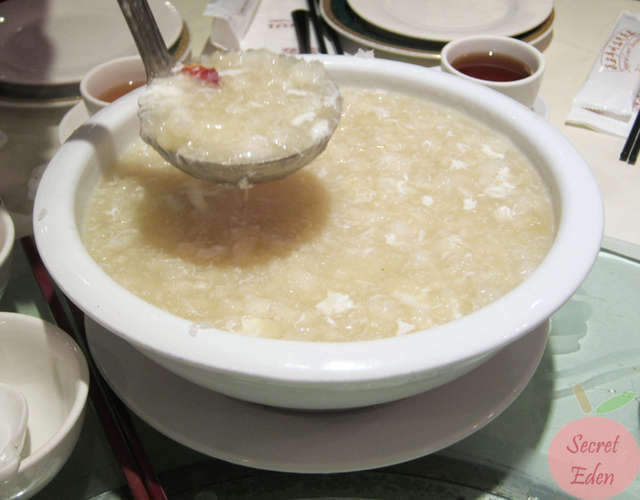 Of course no meal is complete without soup, so our waiter suggested this crab and fish maw soup. I have to say I liked his recommendation. The soup had that seafood umami taste due to the real crab meat and the fresh fish maw they used. I know many restaurant offer several ways to cook the AKC, but here you only get it for one way. If you add another style, it will be $10 more. 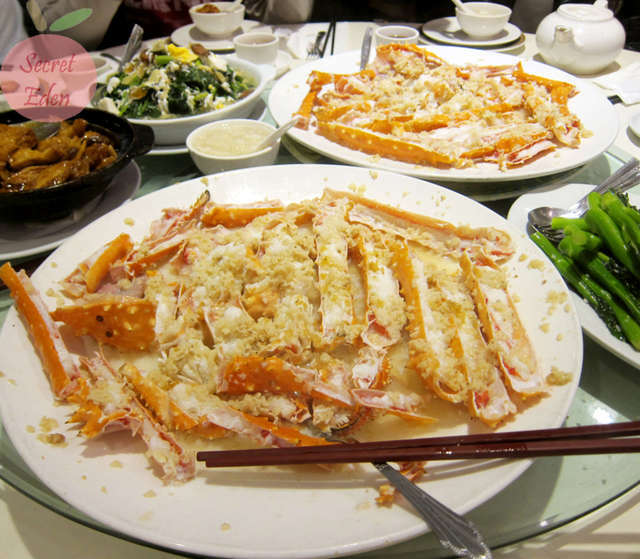 We decided to stick with just steaming the crab with garlic sauce, because it's simply the best way to preserve the fresh taste. I must say, we weren't disappointed. They brought us 2 huge plates of pre-cut steamed crab legs. The garlic/seafood aroma was heavenly. 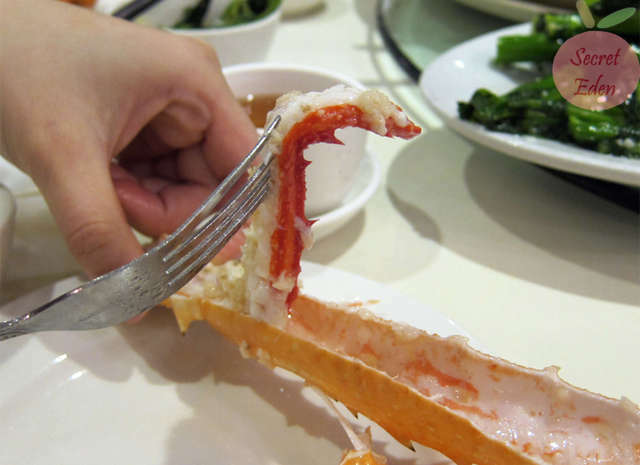 The crab meat was succulent and juicy, you can definitely tell this was really fresh. The best part eating AKC was the no fussy meat removal process, because all you have to do is simply lift it up with a fork. Although we opt to cook the crab only one way, but we did opt for the baked fried rice in the AKC shell for $15 more. The fried rice was quite yellow, so I believe this was a Portuguese style fried rice topped off with some creamy cheese sauce. The rice was a bit dry, but the cream sauce provided the necessary moisture. However there wasn't enough sauce for all the rice. 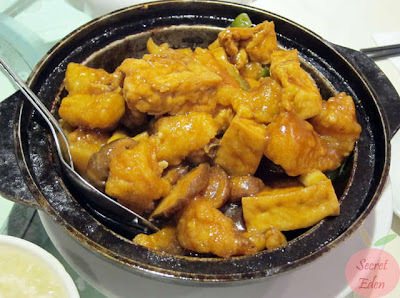 We also ordered a cod/tofu hot pot ($13.99). The portion seems smaller than other restaurant, but at least the taste was great. B thought the usually bland fish was really flavorful here, because it absorbed the sauce quite well. 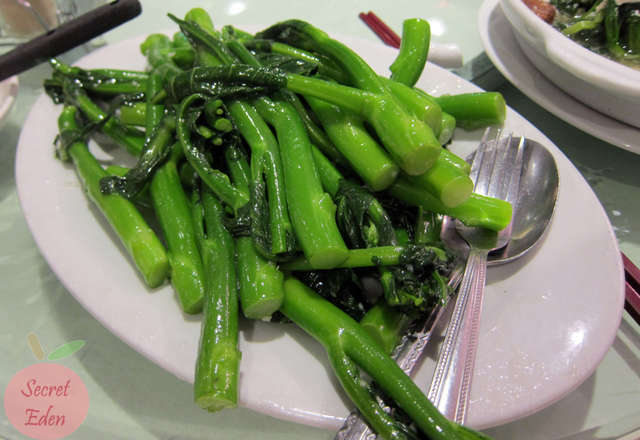 Next is the garlic style gai lan ($12.99). The vegetable was fresh and crunchy, but I thought it could use a bit more flavor. I could barely taste the garlic. 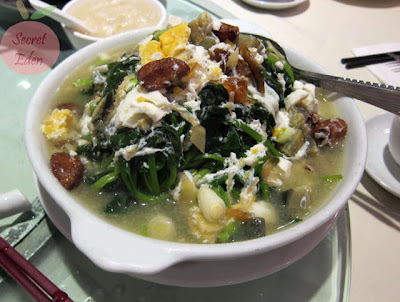 We ordered a 2nd vegetable dish: Spinach with dried scallop and 2 eggs ($14.99??). The portion here is really generous, but the taste was not all that impressive. I find the flavors of the eggs(century and salt duck egg) fight each other instead of working together. Although the dish claim to have dried scallop, it's really just random shredded kind scatter among the spinach. If you don't look careful enough, you won't be able to see it. 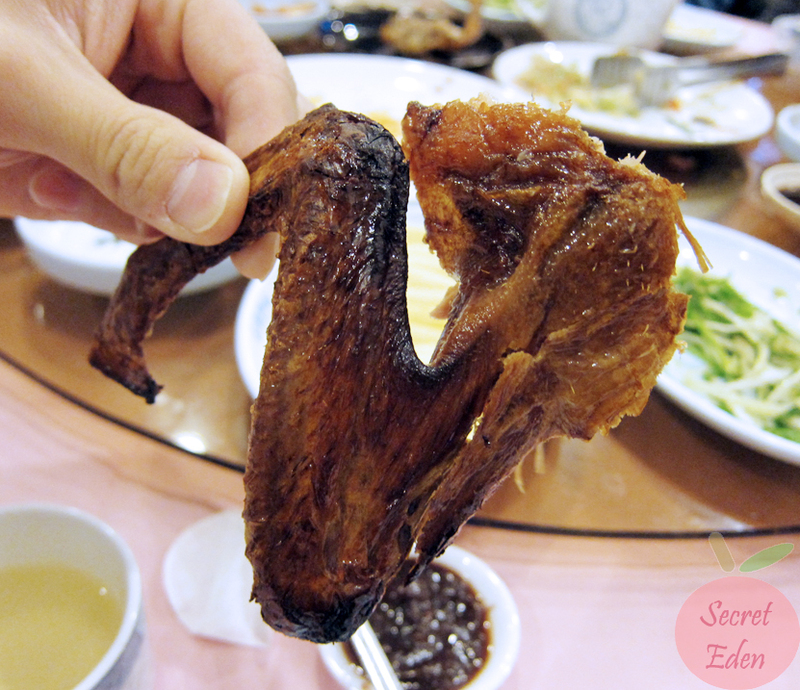 This was half portion of the tea smoked duck ($12.99). Ummmm, did someone eat half of this before they served it to us? This picture was not taken after it was half eaten, this was the full half-portion size as is (maybe they should have used a smaller plate). Any ways despite the small size, the taste was good. I loved the smoked flavor and the duck was tender. Last but not least, we got the braised pork belly ($16.99). Honestly, I was really disappointed when I saw it. The portion seemed really small (they really need to have better plating). Although the meat portion was small, but I pretty sure the it wasn't meant for only 3 people, why they give us only 3 pieces of Chinese bun was beyond me. Anyways, the meat was actually really good, it has the savory yet has a nice sweet flavor, and the fat/skin just melt in your mouth. The buns were perfect for soaking up the sauce, but there just wasn't enough. Although the taste was great, but I really didn't think it's worth the price of $16.99. Service here was not bad. They all moved at light speed, but still paid attention to us by changing our plate and filling our tea often. One thing worth mention was that, they didn't only move at light speed, their dishes also came out in record time. The soup was on our table being served 10 minutes after we finished ordering. Soon after, other dishes just keep rolling out one after another. Another thing I want to point out was that the prices for regular dishes were not cheap, the only reason I gave it a 'fair' is because of the incredible AKC deal. As I already mentioned, I am writing this post now simply because this is too good of a deal to pass up. The other reason is that AKC season is short and almost over, so if you want to enjoy some AKC for cheap, then make sure you make that reservation within the next week or so.